This ham salad recipe is super easy to prepare in a food processor, small food chopper, or minced by hand. Best of all, it's a great way to use leftover ham that always seems to multiply by itself at holiday time. Sweet pickle relish or finely chopped pickles flavor the ham perfectly and a chopped hard-cooked egg adds a certain something but feels free to leave it out if you desire. In addition to being eaten as is on a lettuce-lined plate, it also makes a nice filling for lunchbox sandwiches and appetizers. Use it to fill mini sandwich buns, croissants, biscuits, or small rolls that are perfect for baby showers, parties, or game-day gatherings. For lunch or dinner, serve the sandwiches with a cup of soup, a tossed salad, potato chips, or French fries. If you're on a low-carb regimen, mound the sandwich filling onto mixed salad greens or romaine lettuce leaves. In a medium bowl, mix together the chopped ham, celery, and onion. Add the mayonnaise and mix until well-moistened, adding more if necessary. Add chopped sweet pickles or sweet pickle relish, salt, pepper, chopped hard-cooked egg, and optional chopped parsley. Mix well and refrigerate until ready to serve. 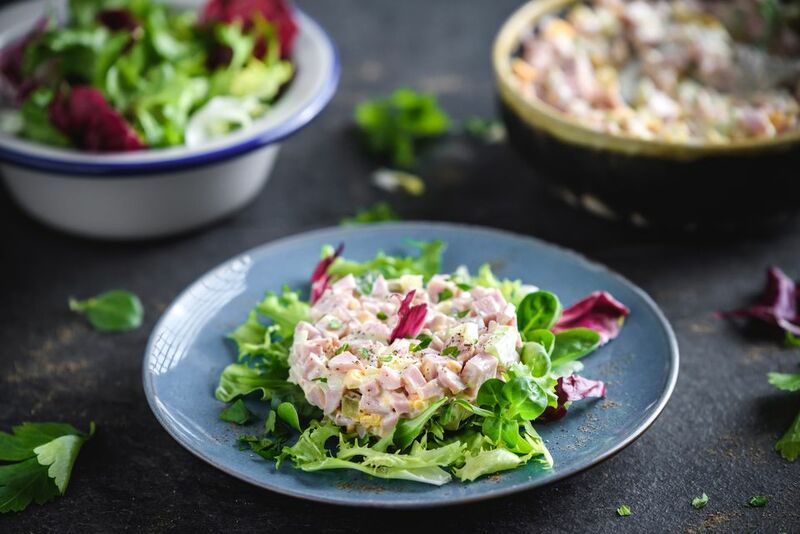 Serve the ham salad on lettuce leaves or mixed salad greens or use it as a filling for sandwiches. The sweet pickle relish can be replaced with dill relish or chopped dill pickles if you prefer a less sweet filling. Add a dash of Cajun seasoning for a little extra zing. Omit the hard-cooked egg or add more than one to stretch this recipe, if desired.